NEWINGTON - The Newington girls basketball team cruised to a 59-15 victory over visiting Bulkeley on Thursday afternoon. Sabrina Soler (9 points), Ashanti Frazier (8), Madison Romanello (8), Erika Cuevas (6), Alexie Armour (6) and Kayla Flores (6) led the scoring for Newington, while Marlie Zocco had six rebounds, six assists and three steals. Bulkeley was led by Yadelis Gonzalez’s nine points. Berlin 61, Ledyard 35: The Redcoats improved to 13-3 with a victory at home. Berlin was led by Lyzi Litwinko (20 points), Ashley Wenzel (20 points), Carly Grega (11 points), Angela Perrelli (6 points) and Wynter Yovan (3 points, 9 rebounds). 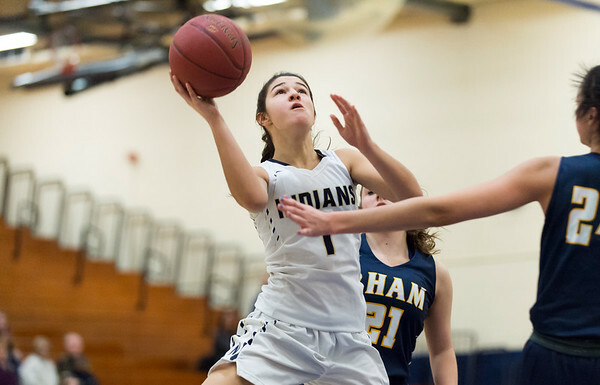 Ledyard (4-12) was led by Sam Money’s 21 points. Goodwin Tech 48, Civic Leadership 25: Goodwin Tech started slow, but came back for a solid victory on the road to clinch a state tournament berth. Goodwin Tech (8-8) was led by Nyssa Foster De Oro (14 points), Joa Martinez (11), Abneliz Alamo (9) and Justina Rodriguez (4). Civic Leadership (5-9) was led by four points each from Asha Ree Mouson and Autumn Penix. Posted in Newington Town Crier, Newington on Thursday, 31 January 2019 21:13. Updated: Thursday, 31 January 2019 21:15.